Are you eternally exhausted? Does it feel like no amount of sleep could restore your energy? 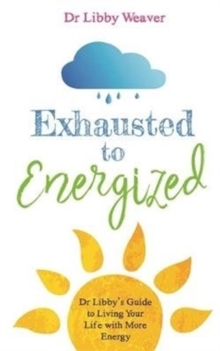 Somewhere along the way, 'exhausted' has become accepted as a normal state of being - but it is not normal, nor is it healthy - it can be a warning sign that aspects of our lifestyle, emotions or body need attention. Nutritional biochemist Dr Libby Weaver has spent 20 years helping people to restore their health and truly understands what it takes to have amazing energy - and also what depletes it. In this book, she explains the nutritional, biochemical and emotional reasons behind that unrelenting feeling of exhaustion. She delves into factors that could be making you feel depleted, including a fast-paced lifestyle, work-related stress, too much screen time, nutrient deficiencies, a lack of joy and even the inability to say 'no'. Combining her professional experience with scientific research and personal insights, Dr Libby shares her solutions to the most common causes of fatigue. This book will explain what you can do to restore your health and finally dedicate your energy to what is truly important to you.